Laser technology has been widely used for processing alumina (Al2O3) and aluminum nitride (AlN) ceramic substrates for the electronics industry for 30 years. 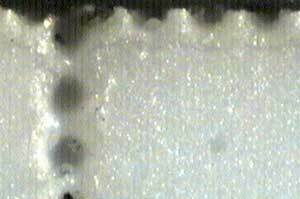 For separating the ceramic substrates into individual components, the laser is used to scribe (drill) a series of partial (blind), high-tolerance holes. These holes penetrate roughly one-third of the way through the substrate and will generate a preferential fault line on subsequent fracture. Using other techniques, vias, slots, locating features, and delicate patterns can also be machined into the substrate (see Fig. 1). 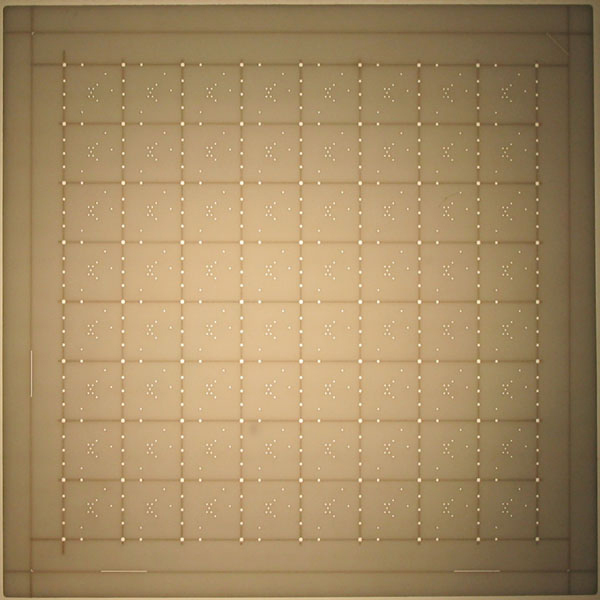 Figure 1: A typical low density electronics substrate showing vias, alignment cuts and holes as well as the scribes used to separate the individual pieces. The number of vias totals some hundreds-high-density substrates can have more than 2000 vias. Due to the absorption properties of the most common ceramics, the CO2 laser has been the laser of choice. The energy of a pulsed CO2 laser beam is absorbed over a short interaction length at the surface of the ceramic, resulting in local heating, melting, and vaporization. Figure 2 depicts a top view of 0.0045-in. scribes cut in alumina and illustrates the accompanying heat-affected zone (HAZ) caused by partial melting under the lower-energy wings of the Gaussian beam profile during the relatively long pulse times used (roughly 75-300 µs depending on the thickness). Figure 2: Whole and fractured scribes have been cut in alumina with a CO2 laser. The pits are approximately 0.0045 in. in diameter, while the HAZ extends for approximately 0.0075 in. Over the course of a year, a flowing-gas CO2 laser operating long shifts will consume considerable resources in terms of gases and energy and will also require a maintenance schedule. Additionally, the pulse parameters typical for this application mean that sealed-tube CO2 laser technology is not well suited. In general, while they have improved significantly over the years, CO2 lasers still trail behind alternative technologies in terms of reliability and maintenance issues. They are also susceptible to drift in beam quality between maintenance intervals; the attainable minimum spot size is also subject to the long wavelength. Alone, the absorption characteristics of the laser beam in ceramics have allowed this technology to dominate this market segment for so long. Previous attempts to use Nd:YAG lasers for this application failed because the absorption at 1.064 µm is simply too weak; not enough energy is deposited in the surface layer to generate the desired effect. To address this, Synchron Laser Service Inc. (South Lyon, MI, USA) developed a surface treatment to enhance the absorption of laser light on ceramics at these shorter wavelengths. The process is quick, permeating slightly into the surface of the ceramic and enhancing the deposition of energy for near-infrared laser pulses over a sufficiently short distance to produce the necessary melting and vaporization. 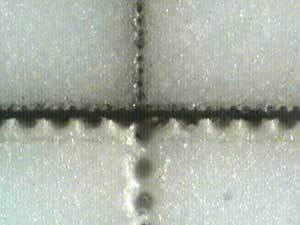 The combination of this patent-pending surface treatment and fiber-laser technology from SPI Lasers (Southampton, UK) has resulted in a process that far exceeds that attainable using CO2 lasers (see Fig. 3). Figure 3: Scribes shown in Fig. 2 are compared alongside those cut using the new fiber laser-assisted process. The holes are roughly 0.00075 in. and HAZ 0.002 in. The surface treatment essentially enhances the coupling of the fiber-laser beam into the top surface of the ceramic to start the drilling process. The enhanced dynamics of the interaction between the laser pulse and the material surface, coupled with a custom, high-resolution beam-delivery system to ensure consistent spot size on the surface, mean that significantly smaller features can now be realized in ceramic substrates (see Fig. 4). Synchron also had considered some of the other laser technologies available that can produce even finer detail, but came to the conclusion that none could additionally offer the speed provided by its own unique approach, in some cases being at least 10X slower. Figure 4: Side view shows scribes made in a 0.027-inch-thick substrate using both CO2 (bottom) and fiber (top) lasers, for the same average power and processing speed. Holes for the CO2 laser are approx. 0.006 in. wide and 0.011 in. deep and have been dyed to improve visibility. 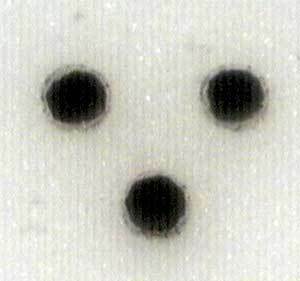 The holes from the fiber laser are 0.00175 in. wide and penetrate completely through the substrate. In comparison to CO2, the process with fiber lasers exhibits better consistency and reliability and provides for finer features, including a better than threefold improvement in edge quality after breaking (see Figs. 3 and 4). Figure 5 further illustrates the edge quality attainable, here depicting the raw edges generated in cutting out the arrowhead shape. Importantly, the new process delivers these results even at throughput speeds unattainable with CO2 lasers. Figure 5: Raw features cut into a 0.040-inch-thick substrate show the entrance side for the laser beam-each arrow measures approx. 0.010 × 0.010 in. (left), while the detail photo also contains scribe pits 0.00125 in. in diameter (right). Scribing speeds are now in excess of 1300 inches per minute for 0.0150-in.-thick alumina substrates, roughly twice as fast as for CO2 (both for 30% penetration), while machining speeds are at least on a par and in most cases faster than CO2. According to Synchron, the motion-control systems rather than the laser now limit processing throughput. Both alumina and aluminum nitride ceramics can be processed in this fashion. With alumina, the process is limited to substrate thicknesses of up to about 0.060 in., although longer term there is a need to process thicker material for more physically demanding applications. A thicker substrate also offers greater heat dissipation, for example for high-brightness LED applications. Aluminum nitride ceramics are generally harder to process than alumina as the thermal conductivity is much greater and processing thus requires proportionately more power. On the other hand, a finer feature detail is achievable as only the highest-intensity portion of the beam causes the desired process, while the material’s high conductivity minimizes HAZ under the wings of the beam profile. Initial results using the new approach are good and the process with this material is still subject to fine tuning. Fiber lasers provide a unique series of performance features that benefit a wide spectrum of materials-processing applications. For example, a reliable Gaussian beam profile (TEM00) is critical to both achieving and maintaining a consistent focal spot size in the surface plane. Fiber lasers excel in this aspect, demonstrating an exceptionally high-quality beam profile at all output powers across the range of possible pulse parameters and thereby permitting large working distances (stand-off). A further advantage is that the small focused spot size and high beam quality translate into high irradiance at the focus, enabling reliable processing at high precision and with minimal HAZ. Fiber lasers have been shown to minimize operational costs through a combination of reduced maintenance costs, no alignment or calibration requirements, longer up-times, and improved production quality at higher throughputs. They also are compact and physically robust, and are thus suitable for the most challenging of industrial environments. Synchron’s proprietary technique breaks new ground in an industry that, while being a vital part of the production of consumer-electronics products, has not matched the technological advances made in other materials processing industries. In a market segment with relatively few major players and which on the one hand is highly cost competitive but on the other also needs to remain flexible to (changes in) customer demands, any process advantage can result in significant market gain. The reduction in feature size that the combination of the fiber laser and the proprietary surface-modification process provides opens the door for finer details to be machined into electronics-grade ceramics at volumes-often exceeding 10 million pieces per month-that easily meet the production demands for mass-consumer electronics such as cell phones and music players and for high-intensity LEDs for backlighting and automotive applications. In fact, some of these industries are specifying <0.003-in. holes in ceramic substrates with better than 0.0005-in. accuracy-a level of resolution not easily attainable with CO2, but which Synchron’s new approach readily achieved in a mass production setting (see Fig. 6). 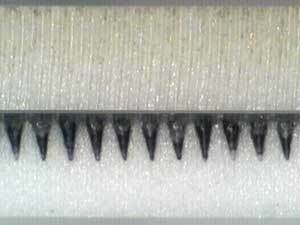 Figure 6: Mass production grade vias cut, not drilled, at >3 holes/s require minimal post-processing (diameter 0.0045 inch, tolerance ±0.0002 inch). Compare to the same size pits for CO2 in Fig. 2, for which the tolerance is 4X larger and where the technology is at its limit. Synchron’s fiber laser process can go even finer and still retain consistency. The surface treatment can be sprayed, dipped, or rolled and does not require any significant drying time. The application of a surface treatment to the ceramic does not necessarily add an additional step to the process, as some sort of coating step (usually an antispattering layer) is common to the established CO2-driven process. Furthermore, the far lower volume of substantially less energetic debris produced by the new process all but eliminates spatter issues. The ability to generate significantly finer features in ceramic substrates at considerably higher throughput speeds provides benefits to the electronics industry in terms of design, performance, and cost. Fiber lasers help achieve a better balance among the principal criteria required for viable competitiveness: usually a complex mix of effective optical performance, process flexibility, high product yield, long system up-times, and exceptional reliability. In Synchron’s case the fiber laser has helped enable a level of process performance on ceramics previously unattainable. Brett Moon is president and Richard Budd is senior engineer at Synchron Laser Service Inc. (South Lyon, MI, USA; www.synchronlaser.com); Jack Gabzdyl is business development manager at SPI Lasers UK Ltd. (Southampton, UK; www.spilasers.com); and Gregory Flinn operates Putting Photonics into Context (Munich, Germany; www.gregoryflinn.net).